Whether you believe or don’t believe the statement that searing a steak or other cuts of meat seals in juices, I don’t know of anyone that disagrees that it adds a rich element to the flavors of the seared cuts of meat. Here we will show you how to sear steak. Caramelization and the Maillard reaction are key to adding flavor, color and texture that you just won’t find in a bland, gray, spongy piece of boiled meat (of course I’m exaggerating here, as I LOVE corned beef). The key to searing on a grill is heat. Reading between the lines of all the science and chemistry on those Wikipedia pages says the grill needs to be HOT. And not just any kind of heat. You need conductive or radiant heat, either a pan surface, or heat straight from the flames. Convection won’t cut it. That means just closing the lid to get the internal temps up isn’t enough. Some high end steak restaurants use extremely hot gas broilers to cook their steaks with a good sear. These broilers can reach temperatures of over 1800 degrees. Many even start with a 600 degree sear plate (like a really hot griddle) prior to putting them in a broiler. So how do you get this at home? Many newer, higher end gas grills now come with a sear burner, an area of the grill that puts out high direct heat that is perfect for searing steaks. If you have one, you should use it on your steaks. If you don’t have a sear burner, well, the honest answer… it isn’t easy to recreate that high direct heat of a commercial steakhouse broiler. There are tricks you can use, but they are tricks and aren’t always practical if you are cooking for a party of 4. But there are more practical ways. 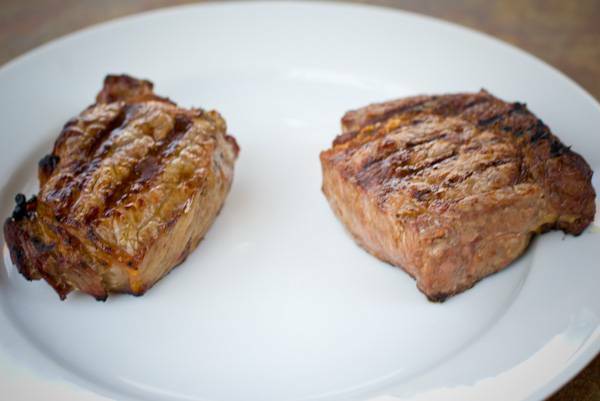 The steaks above were seared on a gas (the left one) and charcoal grill using the techniques described below. One practical option for those of us that use a charcoal grill is to build a bigger, closer stack of coals. You can add some bricks in the bottom of your grill (easiest) to raise the grate that holds the coals, or you can drill some holes (bit more work) and add a higher ledge for that grate using some bolts. direct, radiant heat reading, so don’t compare this to closing the lid and seeing higher temps after 15 minutes. 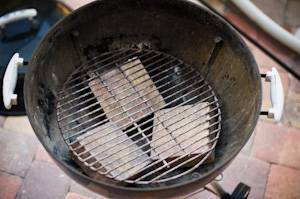 Make sure the coals are at least 2 layers deep and evenly spaced. Make an area with sparse or no coals as a safe zone. You can use this safe zone area to finish steaks when someone wants one medium well or, (say it ain’t so) well done. Follow one of our steak recipes, like filet mignon. and you’ll wind up with a wonderful crusty, flavorful steak. For gas grill owners without a sear burner, there are some options, but they are more difficult. I played around with lowering the grates. 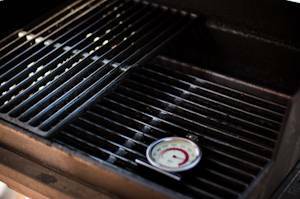 Initially I lowered the grate until it was resting on the Weber’s flavor bars. This got the heat up to nearly 500 degrees F. But being so close, made bad hot spots and made it difficult to cook the steaks evenly. I then tried using some disposable drip pans to prop the grate up a bit more so the heat could circulate under the grate. With the heat up to about 450, I was able to do a pretty good job of searing the steaks. But it isn’t ideal. If you want to cook anything else on the grill, this makes it difficult. Possibly the easiest option for getting a good sear on a gas grill (or charcoal) that doesn’t have a sear burner is to use the pan sear method. Check out the post on pan searing for more details. Using these methods where you sear with high temperature can make you panic that you are overcooking the steak. The outside can tend to brown up quickly, but the inside can still be very rare. 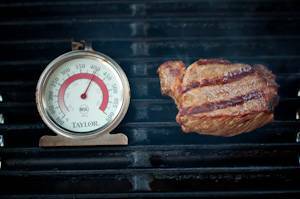 We recommend you always use an instant read thermometer to ensure you are cooking the meat just perfect. 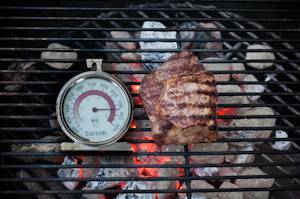 If at any point you feel the steak is getting too brown or burned even, yet the thermometer is indicating rarer than you like, move the steak to a cooler part of the grill to let it finish cooking through. Regardless of how you manage to sear your steaks, I highly recommend you try it. The flavor and texture searing adds to a steak makes the difference between a good steak and a great steak. Now if you really want to get crazy on searing steaks, Alton Brown gives you another option. I personally think this is a bit of a gimmick and isn’t a real feasible option unless you are a bachelor, living in a college apartment. But then why would you be eating steak instead of Ramen Noodles? Well, it is Alton though, and it is pretty cool. Check it out.